I had to think long and hard about what to do for my dad this Father's Day. What would make the day special for him at this stage in his life? As you may know, he has Alzheimer's Disease and is declining. That makes this year's celebration of him especially poignant. My mom and I will probably take him out for brunch, but buying him a gift is not really appropriate these days. Fortunately, he still loves food. Up until the last couple of years he loved to cook and he still loves to eat. 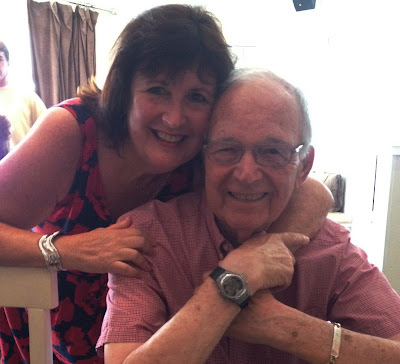 When we were kids, he and my mom loved taking my brother, sister, and me to restaurants that back in the 60s and 70s were unusual at the time--tempura bars, Cuban eateries, Russian fine dining. They wanted to expose us to whatever got us out of our burger or mac and cheese comfort zone. 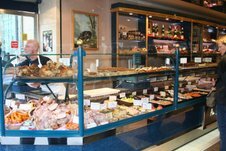 Even today we go out for Chinese and sushi, burgers and fish and chips. His favorite place to eat these days is Supannee House of Thai in Shelter Island for sweet and sour mixed seafood over brown rice. I love making food gifts for him and in the past few years I've taken to making him pickles. But it's too early in the season to make him his favorite bread and butter pickles or dill pickles. If not pickles, then what? 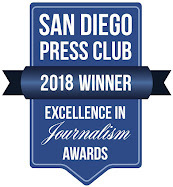 Fortunately, I just wrote an article about a new book on canning for the San Diego Union-Tribune, which will appear in the paper's food section next week. 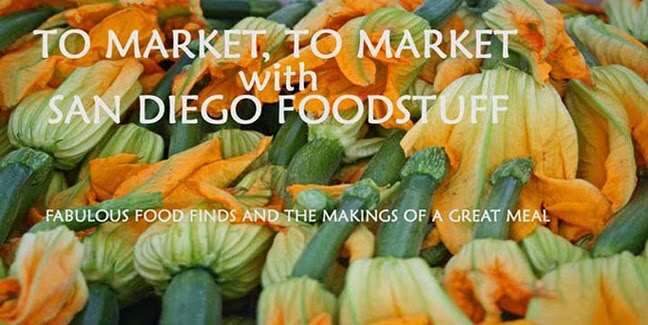 The book, Naturally Sweet Food in Jars by Marisa McClellan, revolves around her successful efforts to use alternative sweeteners instead of refined sugar when making everything from jams and jellies to sauces and pickled vegetables. McClellan, who is the author of two other cookbooks and the blog, Food in Jars, selected naturally occurring sweeteners that still facilitate canning and even add flavors--honey, maple syrup and sugar, coconut sugar, fruit juices, agave, and dried fruits. I'd already made a couple of the recipes--loquat jam with agave and marinated multicolored peppers with honey-- and was looking forward to making more of them. So, I poked around the book and had an "aha" moment. My dad has always loved canned peaches. 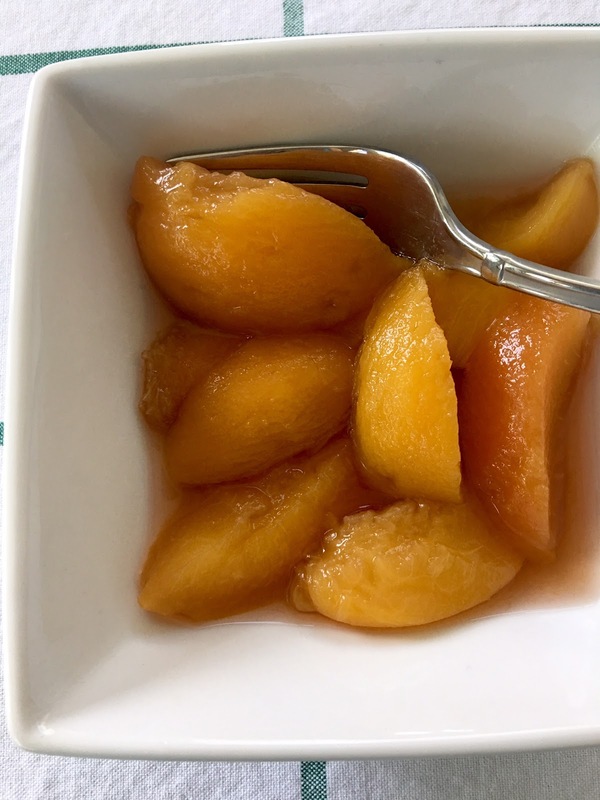 Here was a recipe for peach slices with bourbon, using maple syrup as the sweetener. There was just one obstacle. My dad has never liked spirits. So, I did a little hunting around my pantry and had my second "aha" moment: Cointreau! Orange and peach flavors can be a lovely marriage. And it would also complement the maple syrup in McClellan's recipe. Perfect. That was the only alteration I made to the recipe. I bought six pounds of fragrant yellow peaches and spent an early Sunday afternoon making the peach slices. It's a little labor intensive since you have to halve, pit, and skin the peaches. As McClellan says in her recipe's headnote, you really want to use freestone peaches for this. I did not. So it was challenging. Ultimately I used a paring knife to cut around the pit on one side to separate the halves and then to cut it out from the half it clung to. It wasn't pretty but it got the job done. Everything else went very well, including blanching the fruit to loosen the skin from the flesh. 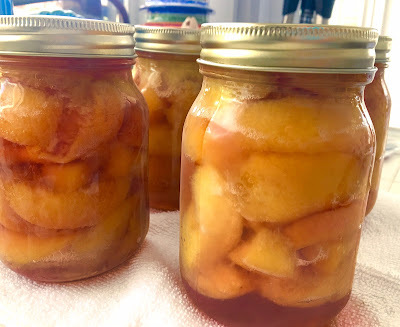 From there, you make a syrup that you slice the peaches into, cook briefly, and then place in the jars together before processing. The result is divine. The peaches bring their own sweetness, the maple syrup adds more but it's very subtle, as is the underlying flavor from the cointreau. The peach slices are tender and I know my dad will enjoy eating them with a little whipped cream. But you should also consider using them to top ice cream or sorbet this summer, or perhaps some pound cake or angel food cake. Save a couple of jars in your pantry and when you're feeling a little wistful for stone fruit next February, you can satisfy that yearning. To all the dads out there, enjoy your day! I hope your family makes a big fuss over you! The trick to canning peaches is to look for the freestone varieties. They typically arrive in markets towards the middle point of peach season and they will make your workload far lighter. You can’t tell by looking what kind you have, so ask your grower or the produce person at your local market. Tell them you want them for canning, they’ll understand. Prepare a boiling water bath canner and 4 regular mouth pint/500 ml jars according to the process on page 12. Bring a large pot of water to a boil. While it heats, cut all your peaches in half and remove the pits. Fill a large bowl 2/3 the way up with cold water and add 2 tablespoons lemon juice. The cold water stops the cooking and the lemon helps prevent the fruit from browning. Working in batches, proceed to blanch all your peach halves for 60 seconds. Make sure to give the water a chance to come back up to boiling between batches. If the water isn’t hot enough, you will have a hard time removing the skin during peeling. Once all the peaches have been blanched and they are cooling down, make the syrup. Combine the remaining lemon juice, filtered water and maple syrup in a saucepan large enough to eventually hold all the peaches. Place over medium heat and bring to a gentle simmer. While the syrup heats, slide the peels off the peaches and cut them into wedges. Drop the cut wedges into the heating syrup as you work. Once all the peaches are in the syrup, raise the heat to high and bring the pot to a boil. Using a slotted spoon, funnel the peaches into the prepared jars and top with the syrup, leaving 11/2 inches/3.8 cm headspace. Add 2 tablespoons of bourbon to each jar. Tap the jars gently on the countertop to settle the peaches and use a wooden chopstick to remove any air bubbles. If necessary, add additional syrup to each jar, so that each has a finished headspace of 1/2 inch/12 mm. Wipe the rims, apply the lids and rings, and process in a boiling water bath for 25 minutes (see page 12). Note: Most the time I’ll tell you that you can use whatever jar you want, but for these peaches, I actually do recommend opting for regular mouth jars. Their shoulders will help keep the peach slices submerged in the syrup and that will ensure they keep their quality longer.